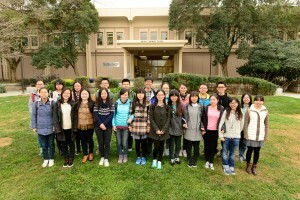 Students from Nanjing Agricultural University in China visit UC Davis. Our school has a global influence because we engage the world. We have become an institution with broad impact by promoting programs that reach out to address our societal needs across the globe. Our Office for Global Programs, led by Drs. Pat Conrad and Paulina Zielinska, was established to promote, facilitate and support global programs that align with our mission and enhance discovery, while educating future generations of global health leaders. Through our people and programs, ample evidence is accumulating that we are accomplishing these goals. Just within the past year, joint conferences with our international partners have been supported that link our faculty, staff, and students to academic partners in multiple countries. A recent example included a workshop between the University of Sydney and UC Davis held September 17th to 19th at Lake Tahoe. Through faculty discussions and brainstorming, these types of conferences help align and stimulate ideas that go beyond a single institution and expand educational opportunities for our students. Last week we held our 11th annual “Stars in Science Day,” highlighting students who have performed research over the past year. The STAR (Students Training in Advanced Research) program is coordinated through our Office of Research and Graduate Studies. The program offers funding opportunities on a competitive basis to veterinary students to experience veterinary and biomedical research during the summer months. Research experiences are available at UC Davis and in San Diego through the UC Veterinary Medical Center partnership. For some of the students who attended the National Veterinary Scholars Symposium at The Ohio State University early in August and the California Veterinary Medical Association Pacific Veterinary Conference in June, this was the third time they presented projects. The objective of the STAR program is to identify, nurture, and support veterinary students to experience biomedical, basic, applied and translational research in all its many facets. With guidance from their faculty mentors, students gaining these experiences are becoming leaders that will advance both veterinary medicine and biomedical science to address fundamental issues facing our society. Veterinarians trained in research are unique in their comparative understanding of animals and biology, and form a critical bridge between multiple disciplines through their One Health approach to scientific investigations. As the current Zika virus outbreak demonstrates, animal and human diseases do not respect boundaries and can move with vectors, animals, or people across the world in a matter of hours. A comprehensive approach to health must involve highly trained veterinarians who are comfortable interacting with physicians, public health officials, and the many other disciplines important to form an effective approach to prevent or control diseases.